Discover interesting facts and information about the weapons, including the arrows held in the Quivers made by Native American Indian tribes. Description and Definition of a Quiver: A Quiver is a portable sheath that contains arrows to be carried on the person. The size of a quiver was dependent upon the type of bow used, the length of the arrows and how many arrows were required. Native American Quivers have been traditionally made of leather, bark, fibers, wood, furs and other natural materials. The choices of material used to make quivers needed to be strong enough so that the quiver would not be pierced by the arrows. The arrows were typically placed tip side down in the quiver. Quivers were often made from pelts from animals such as the fox, otter, coyote and beaver. The arrows in the quivers needed to be accessible so that a person shooting a bow could quickly extract an arrow. Most quivers therefore had an open or 'flip-back' top and was seamed or closed on the bottom and sides. Quivers were carried across the back or slung over the shoulder but carried on the side or hip. The fast release of arrows was essential whether used for hunting or for fighting. Native Americans were able to make one shot every 3-4 seconds at a range of about 200 yards. All Quivers had a comfortable trap to enable the Native Indian to sling the quiver over his shoulder of back. Quiver straps were made of strong material such as different types of leather and, like the quivers, were often decorated with intricate patterns and designs and embellished with by intricate quillwork and beadwork and might also be painted and adorned with feathers or fringes. The straps were sewn on to the quivers using sinew, or occasionally, by using a form of hide glue. Many quivers were made with animal skins and adorned with their fur, as the pictures of quivers on this page illustrate. The adjacent picture of a quiver made beaver skin is also embellished with beadwork. Traditionally quivers were also made from pelts of the fox, raccoon, wolverine, bobcat, mountain lion, bear, otter, coyote and beaver. The Mohave tribe made quivers from the fox, as seen in the picture below. The quiver measured about 3 feet long and 3-4 inches across and carried 15 arrows. These types of quivers were reinforced along their length with an arrow weed rod to which a sinew cord was attached for slinging quivers over the back. The Diegueno Indians of California coyote quivers from a whole, tanned coyote skin. 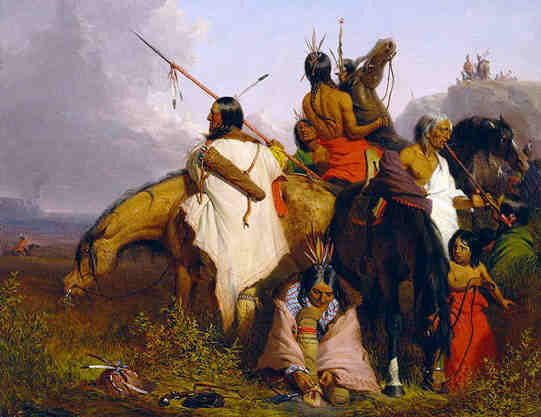 Coyote quivers were hung on the back with the hind legs looped together to fit over the neck and the forelegs tied around the waist of the Indian, in the same fashion as a knapsack. The tail of the coyote hung loose down the back of the quiver. In the bottom of the coyote quiver, and other types of quivers, was a clay cup in which the tips of the arrows would be kept. The 'cups' were also used as containers for poison that was sometimes added to the arrows. For additional facts and information on this subject please refer to Poisoned Arrows. Many Native Indian quivers were elaborately decorated with intricate quillwork and beadwork. The quivers might also be painted and adorned with feathers and paint. The patterns on quivers and quiver straps included traditional Native American designs used by specific tribes or symbolic designs (for more information refer to Native American Symbols) the designs on quivers might also be personalized to the wearer, especially when used as part of the regalia for important ceremonies, or reflect the symbols associated with his clan. The hide or leather material was then often decorated with quillwork or beadwork. An additional embellishment was to add a fringe to the Quivers. Occasionally quivers, but most often, quiver straps were decorated by a technique called quillwork. The quills refer to porcupine quills. Porcupine quilling is an ancient Native American Indian art used particularly among Great Plains Indians and Woodland Indians. The method for creating quillwork involved softening and dying stiff porcupine quills and weaving them on to the leather quiver straps. 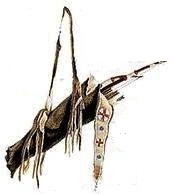 Quivers and quiver straps were also decorated by some tribes by a technique called beadwork - see the picture of the Beaver quiver. Native American beads were carved from natural materials like shells, coral, turquoise, wood, amber, animal bones, horns and teeth and used to produce beaded leather for making quivers and straps. The beads were sewn onto the leather individually, or in loops, or rows of beads that had been previously stitched together into strings using animal sinew. Quivers. Discover the interesting facts and information which relate to the History of Native Americans and the weapons they used such as the Quivers. The pictures on this site show the weapons and tools that were used by various Native Indian tribes that can be used as a really useful educational history resource for kids and children of all ages. We have included pictures and videos to accompany the main topic of this section - Quivers. The videos enable fast access to the images, paintings and pictures together with information and many historical facts. All of the articles and pages can be accessed via the Native Indian Tribes Index - a great educational resource for kids providing an unusual insight into their culture. We hope you enjoy watching the videos - just click and play - a great resource for gaining facts and information about the life of Native American Indians.